As promised we had an Egg Nog taste off last night to determine what the best spirit is for mixing in this delicious beverage. From what I’ve read it seems the three main choices are whiskey (bourbon specifically), rum, and brandy. I enlisted the help of my friends Mike and Crystal to get to the bottom of this difficult case. For the spirits I chose Eagle Rare 10 yr Bourbon, Flor de Cana 7yr Dark Rum, and Germain-Robin Fine Alembic Brandy (lot 23 if you care). All of these are aged spirits and therefore have a nice dark color and a complexity of flavor that can only be obtained from aging. We mixed one ounce of spirit with about 4 ounces of egg nog for the initial round of tasting. Mike and Crystal liked the rum best because it nearly completely blended in to the nog adding nice additional flavor without adding any extra alcoholiness. I’d agree, although the rum is certainly present and you can taste it the flavor doesn’t overpower the egg nog at all. Their second favorite was the brandy. It added a nice flavor but had more of an alcohol aftertaste than the rum which although not unpleasant it wasn’t what they were looking for. The bourbon came in dead last for Mike and Crystal. Neither of them liked the additional flavors that the bourbon brought and both disliked the aftertaste. This is where I differed though. I really enjoyed the addition of bourbon. I like the extra flavor components and complexity that bourbon brings to the party. Overall my recommendation would be to go with bourbon (or the whiskey of your choice) if you like whiskey to begin with. And this is a perfect case of really needing to use bourbon that you like to drink by itself. 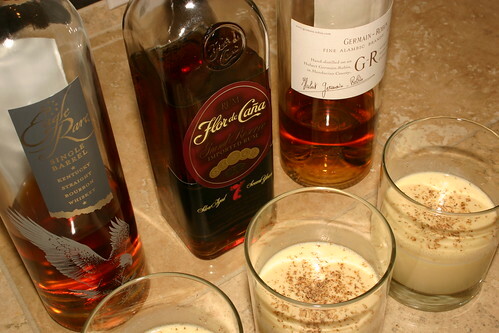 A crappy tasting bourbon won’t be improved with egg nog. You’ll simply end up with a crappy tasting glass of egg nog. On the other hand if you’re not a huge whiskey fan or you’d prefer a smoother, more integrated flavor then I think a good dark rum is the spirit of choice. A light rum could also be used, but since it’s not aged it won’t add that much in the way of additional flavor. Excellent work! So a nice rum is a key, mellow player suitable for those who do not enjoy the more hefty flavors.